The pervasive force in the relationship between the nation-state and Australian Indigenous peoples during the 1990s and 2000s was, and is, neoliberalism. Free market ideals became the dominant political philosophy and Indigenous people were coerced into a political 'experimental' cutting of a neoliberal template into the fabric of Indigenous life. The pairing of market ideology with concerted efforts to de-power Indigenous groups and people align, at least thematically, the Indigenous experience of neoliberalism with that of a social movement. This article details the entwined story of explicit Indigenous resistance and activism and the how and what of the infiltration of market forces into Aboriginal territory. 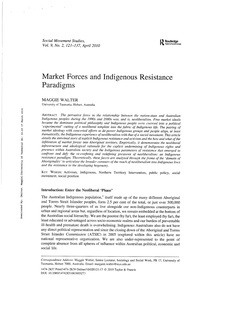 Empirically, it demonstrates the neoliberal infrastructure and ideological rationale for the explicit undermining of Indigenous rights and presence within Australian society and the Indigenous parameters of resistance that emerged to confront and defy the re-confining and redefining pressures of neoliberalism: an Indigenous resistance paradigm. Theoretically, these facets are analysed through the frame of the 'domain of Aboriginality' to articulate the broader contours of the reach of neoliberalism into Indigenous lives and the resistance to the developing hegemony.